I'd fallen into a rut of wearing wrap dresses to the office, so tried to make a little bit of effort and wear my maternity pencil skirts for a change. 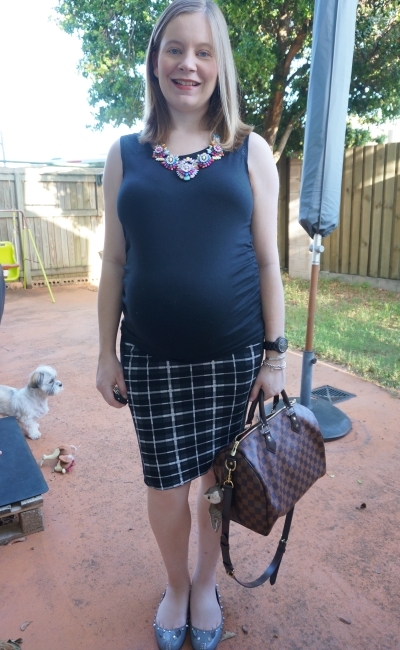 I do love these skirts, and wore them a lot in my last pregnancy, but this time around I've been so uninspired with facing the summer heat in the third trimester that dresses have just seemed easier! It was a slightly cooler morning so I got excited and wore a jacket. While I liked the extra print mixing it brought to my outfit, I quickly realised that it was still much too hot for wearing layers, and regretted my decision a little. By the time I went to my OB's appointment in the afternoon, I'd had my jacket off for a while! Last worn: jacquard blazer, white maternity tank, graphic print pencil skirt, Walnut Melbourne ballet flats, Louis Vuitton speedy bandouliere. Other ways to wear: jacquard blazer and a little black dress, white maternity tank and denim shorts, graphic print pencil skirt and a grey tee, black ballet flats and skinny jeans, Louis Vuitton speedy bandouliere and winter layers. Kept things much simpler with this outfit - no extra layer, I added a statement necklace for a bit of interest instead. I've worn this necklace and tank together before - I love the way the colours look against the black. Last worn: laser cut detail tank, Asos maternity tartan pencil skirt, studded mouse flats, Louis Vuitton Speedy bandouliere (above). Other ways to wear: laser cut detail tank and denim shorts, tartan pencil skirt and a grey tee, studded mouse flats and shorts, Louis Vuitton Speedy bandouliere and denim shorts. Linking up with Let It Shine, Shoe and Tell, Modest Monday, Hello Monday, Mix It Monday, On Trend, Style Sessions, Turning Heads, Confident Twosday, What I Wore to Work. I absolutely love your statement necklace! You look beautiful! Thanks Sarah! It is a great jacket, it will get a lot more wear when it cools down for sure! They are great for the office! Oh, you look so chic and stylish in both of these looks! The second one is my favorite, as I really like the clean and simple lines. Love the second picture the best. The skirt looks great with the black top and necklace. haha yes they are predicting it will cool down at least, after my due date! So we will see! Mica, you are a rockin mum! I love the prints of those skirts. Look very good on you. At least your layer was easily removable! I hate days when I end up wearing a sweater only to realize it's way to hot :/ You look cute in both looks! I really like the shoes in your second look! Simple and chic as always! You look great. Both of these looks are great on you! I love the print mixing in the first look, and the second look is so chic and put-together. These are such lovely pairings you've shared here, Mica! I especially love look #2, the necklace is so gorgeous! Thanks so much for sharing and I hope you have a great week ahead! I love the second outfit! I mean the first is great too, but the white would give me anxiety. But the second, yes, that's a winner. 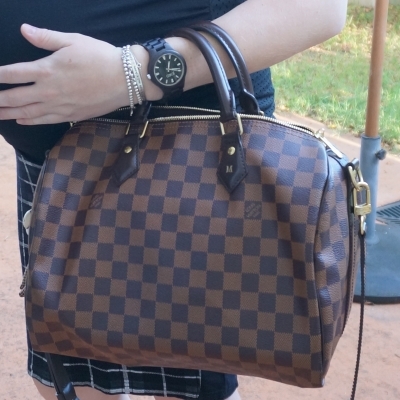 I love the necklace, and the bag contrasting but kind of going with the patterns. I'm hoping your third trimester is continuing to go smoothly! They both look lovely on you! It's always fab when you feel confident in an outfit! Love the second outfit! The black with the pop of color from the necklace really looks good. And it's good to hear that you felt really confident in it! Whenever an outfit makes me feel like that I never switch it up lol. Yep, it's awesome to have something to wear that makes you feel great! Oh, wow! I love those skirts so much! LOVING that blazer in your first look!! I really like the mix of patterns and textures in the first outfit! love the both outfit on you! great style! I love both looks. That jacket is so classy! I wish we had warmer weather here. While I'm wishing for autumn weather here, haha! Both looks are so classic. I love the mix of textures in the first look. You are always so good at that! Your tanks and skirts look great! Can't blame you for throwing on that jacket in the first outfit, it's so cute!!! It is a great jacket, if a little too warm to wear on that day! Such a great bag, lady! 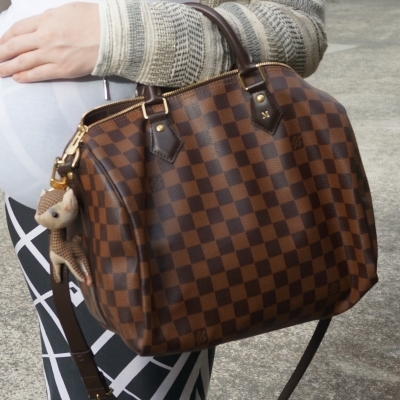 Love me some LV! You look amazing in this skirt. I totally agree, sometimes the simples outfits make you feel like a million bucks. The issue is finding THOSE! Yes, it can be a lot of trial and error! Both patterned skirts are beautiful, and I love the second colourful necklace! I am still loving both of those necklaces so hard. The jazzy coloured one with the black tank is so perfect! I have lots of statement necklaces but I never seem to have the right neckline to go with them. great skirts!!!! love the geometric patterns! I'm surprised you Queenslander's even wear jackets hehehe! I love that you've brought back skirts, I feel you about the heat. Dresses are just so much easier. Haha yes I don't wear jackets too often! Love the pencil skirts, a fun change and I see your little pup in the background trying to get in on the action. Love the jewelry too!